2. 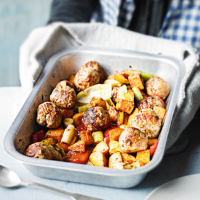 Mix the turkey, paprika, oregano and 1 tbsp pesto together, season and mould into 12 balls. 3. Place the vegetables in a large roasting tray and toss in the oil and remaining pesto. Nestle the meatballs into the vegetables and cook for 30 minutes until tender and cooked throughout.